When I was kid in the 1960s, the cafeteria at my elementary school served the most delish brown bean chowder for lunch. It was a big hit with the students, including me. When it was announced that it was "Bean Chowder and Cinnamon Roll Day" it was THE big news of the morning. I still remember coming in from recess, chilled to the bone, and this chowder really warming up my insides. I'm not sure why the bean chowder was always served on the same day as the homemade cinnamon rolls but I never complained! 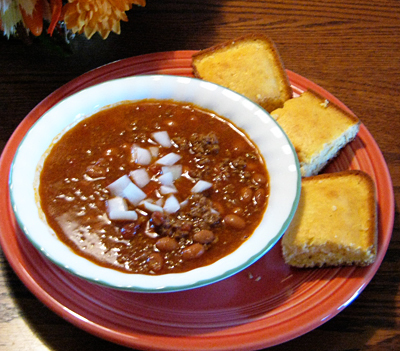 This recipe is similar to a mild chili but a little more soup-like. Perfect for fall weather. I like making it with coarse-ground hamburger so you get big, meaty pieces in every bite. The original school recipe was for a crowd and required soaking the dry beans. 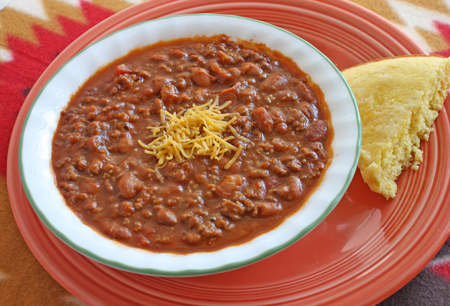 I adapted the recipe to serve eight and to use canned pinto beans, saving time. Try it and tell me what you think! The holidays are coming...check your spices!